Revelation may be the most intriguing book in the Bible. It is full of powerful imagery, describing the terror of evil and the conquering power of God in Christ. Christians past and present have recited passages from Revelation to prepare for worship and to overcome persecution. In today’s lesson, we will learn about heavenly worship. How easy it is for us to go through the motions of worship. We can go through the order of service with empty hearts and empty heads. We can sing the “Lord’s Prayer” or sing “All Hail The Power Of Jesus’ Name” while yawning at the same time or flicking through the edges of the Bible. Actually that is quite a feat. Some try to tap into some “good feelings” while worshipping, not actually turning their hearts to God. So what is the model of worship? This is the theme of a popular praise song, “The Heart Of Worship.” One lyric reads, “I’m going back to the heart of worship…it’s all about you. It’s all about you…Jesus.” So, what is the heart of worship? And how can we get back to it? What or who do we have to get back to? In chapters four and five we see the picture of heavenly worship. We can learn why and how God is worshiped in heaven. We can participate in this worship even today. This can be our model of worship. In this part, John is taken up before the very throne of God. Look at verse 1, “After this I looked, and there before me was a door standing open in heaven. And the voice I had first heard speaking to me like a trumpet said, “Come up here, and I will show you what must take place after this.” This is not about heaven coming down and filling one’s soul with glory. It is about John going up to heaven where God’s glory fills everything. The first thing John mentions is a throne with someone sitting on it. Look at verses 2-3, “At once I was in the Spirit, and there before me was a throne in heaven with someone sitting on it. 3And the one who sat there had the appearance of jasper and carnelian. A rainbow, resembling an emerald, encircled the throne” A throne symbolizes the majesty and power of a king. Thrones evoke reverence and humility from those who would approach. And rightly so. This King, at a word, has power to create, destroy, and judge everything in all creation. His power and majesty are manifest. Verse 5 says, “From the throne came flashes of lightning, rumblings and peals of thunder.” It is interesting that John never calls God by name. He calls him “the one seated on the throne” again and again (4:2,3,9,10; 5:1,7). John was awestruck by the power and majesty of God. John proclaims that God reigns over the universe from his throne. When we come to worship God, we must realize we are approaching the great King of the whole universe. It is easy for us to be too casual in our attitude toward God. Our inner attitude, and the outward manifestation should reflect the faith that we are coming before the King of kings and Lord of lords. Some of us have greater respect coming before the President of the United States, a doctor, a police officer, a sports star or a singer than coming before God himself. Some Justin Bieber concerts had to be canceled because of screaming girls. Would they scream if Jesus was coming to town? We must come before God with humble reverence and awesome respect. The appearance of the throne gives us glimpses of who God is. Look at verse 3. “And the one who sat there had the appearance of jasper and carnelian. A rainbow, resembling an emerald, encircled the throne.” Perhaps the image here is that of light shining through crystal, as when brilliant light flows through a prism producing a spectrum of color that dazzles our mind’s eye with its beauty. If we turn the prism just slightly, it produces a whole new array of color, diverting its shafts in myriad directions. This is like Jesus. There are hundreds of names to describe Jesus…The Lamb of God; The Springs Of Living Water; The Bread of Life…etc. Beholding Jesus is like beholding an ever changing crystal in all of its brilliance. The emerald rainbow suggests greenness, which represents life, life that issues forth from God, the source of life. The absence of God is sometimes described as a desert. God’s presence brings life; flourishing, growing, abundant life. Moreover, the rainbow reminds us of God’s covenant with Noah. (Gen 9:8-17) God promised not to destroy the world with a flood again, even though mankind is evil. God remembers and keeps this promise faithfully. Thunder and lightning recalls God’s covenant with Moses to make his people a kingdom of priests and a holy nation. (Ex19:5,6,16) God keeps this covenant even though his people are often unfaithful. This is the God of the covenant. Though he is the Almighty God, he has limited himself, through covenant promises, to mere people. God does not exercise his mighty power at random, as a spoiled son of some totalitarian ruler might do. God reigns over his creation according to his covenant promises. We can trust God. When we survey chapter four as a whole, we find that it describes a worship service in heaven. Surrounding the throne were twenty-four other thrones, and seated on them were twenty-four elders. They were dressed in white and had crowns of gold on their heads (4). Most likely, they represent the twelve tribes and the Twelve Apostles. They represent the redeemed of the Lord throughout all ages, before and after Christ. They have been sanctified and given glory and authority from God. Then, in the center, around the throne, were four living creatures. They were covered with eyes, in front and back, and they had six wings. These four living creatures are, in a sense, worship leaders. 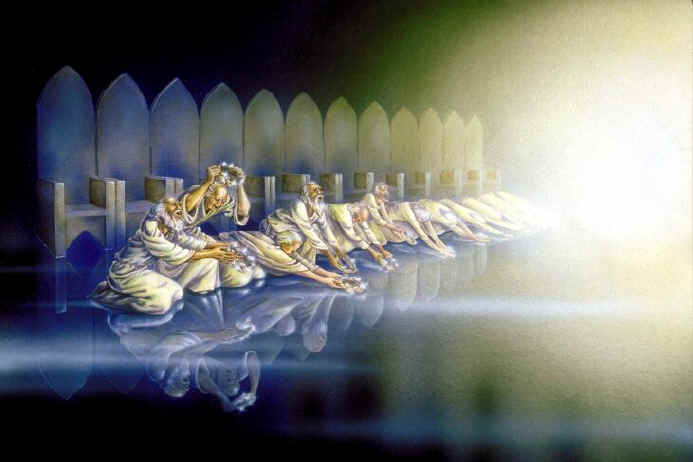 On their cue, the twenty-four elders fall down before him who sits on the throne and worship him. Now we can understand why the living creatures needed so many eyes. Consider a chorus and orchestra conductor. As he conducts, his eyes dart back and forth, from one section to another, and he works hard to keep everything in harmony to produce the most beautiful choral performance. However, since he has eyes only in the front of his head, he cannot see the musicians and audience at once. He actually needs eyes in the back of his head. These living creatures always see God and the assembly before them simultaneously. They are always ready to respond to God. They see everyone, engaging everyone in worship. No one could sneak in the back unnoticed. The eyes under their wings suggest that nothing is hidden in the worship service. They seem to be equidistant from each other, to form a kind of “surround sound” effect of worship and praise. The living creatures lead others by first worshiping God themselves. As they give glory, honor and thanks to him who sits on the throne, the twenty-four elders fall down before God and worship him willingly and whole heartedly. We should learn from these creatures. We should lead the way in worship. When others come to worship service we should set the example. We should be very attentive to Jesus. Our worship should be full of praise, prayer and thanksgiving. Our worship should inspire others to worship God also. May that be the kind of worship that happens here at NIU UBF every Sunday. Consider the elders. As they fall down, they yield all of their authority and power to God, recognizing God’s supremacy. They lay their crowns before the throne as they worship (10b). These crowns represent the church triumphant. God has given victory to his church in accomplishing its purpose. This victory has come through many individual battles and through the church’s corporate struggle as well. Finally the church’s victory is given back to God. This is part of worship. This is why we must overcome the world and render victory and glory to God in our personal lives and as a church. God has given each of us so many victories in life, in regards to school and work and sports etc. How easy it is to keep that glory for ourselves, seek more of it and revel in it. This is like prancing around, showing off our crowns defiantly, ignoring the fact that others are laying down their crowns at the foot of God’s throne. But may we learn from the elders to toss our crowns at the foot of Jesus and give all the glory, honor and praise to Jesus in very practical ways. This is actually the most glorious thing you can do with your victories in life. We can learn why God is worshiped in this way by listening to the worshipers. The living creatures say, in verse 8b, “Holy, holy, holy is the Lord God Almighty….” These creatures proclaim God’s holiness. This is the distinctive feature which overwhelms them. Holiness is that quality of God’s character that completely transcends his creation. We cannot fully understand it. To scratch the surface, in describing his holiness, we can say that God is absolutely perfect in his morality, ethics and spirituality. His motive is always right. His knowledge is perfect. His character is flawless. His love is complete. Just think about how many decisions God has made. Not once did he ever make a wrong decision, in spite of Satan’s mischief and mankind’s sinfulness. (Ro 8:28) God has governed the whole created world with perfect wisdom to accomplish his own purpose. God’s holiness is like a consuming fire. It breaks out against impurity and imperfection (Ex 19:22,24). No human being can approach God at random. We must come before him humbly and with a repentant heart. We must be ready to receive conviction of sins which we are usually too dull to be aware of. What does “receive conviction of sin” mean? Think of it this way, when we are around someone who is always generous in serving others, we are convicted of our own selfishness. Likewise, when we stand before the holy God, all of our imperfections and sins are exposed. It is not easy to bear. In our humanness we would surely respond in self righteousness and self justification. Some would lash out at God. We need a warning about his holiness. The living creatures help us to be alert, not being caught off guard, so that we being ready to respond properly to God’s holiness. What is the healthy response? It is recognizing God’s holiness, repenting of our sins and aspiring to grow in that holiness is the proper response and is essential in worship. Let’s learn more about God in verse 8b. The living creatures said, “who was, and is, and is to come.” (8b) God is eternal in nature. God has always existed, he exists now, and he will always exist. All other creatures are dependent on something else. But God is different. God is absolutely independent. Man did not invent God. He exists in and of himself without help from anyone. The elders’ words of worship are recorded in verse 11. They say, “You are worthy, our Lord and God, to receive glory and honor and power, for you created all things, and by your will they were created and have their being.” God created all things, including each person’s life. God did this by his own will. He did not act as anyone’s agent. God made all things by his own free choice to do so. God did not need to make us. God has everything he needs in his own being. The created world is to God like a garment that he wears for a while (Ps 102:26). He can change it and put on another one as he pleases. Why do each of us have life? It is because God decided to give us life. We exist purely out of God’s kindness and grace. He willed us into existence and wants us to live in a love relationship with him forever with him in the Kingdom of God. This is one reason why we worship God, our Creator. We are compelled to do so by realizing his holiness, power, goodness, and grace. The last part of verse 11 says that we have our being in God. Our true identity is in God. People travel to the ends of the earth and experiment with many things in order to “find themselves.” But when we know God and find ourselves in God, we can find out who we truly are. This comes when we worship God. There are many who don’t know their own identity in God. They only know their parents’ identity or a friend’s identity or the identity of a world sick with sin. The wonderful truth here is that when we worship God, we find our own being in God, that is, who we really are. This is what our young people are desperately searching for. May God bless you to worship God with all your heart in this year and discover your true identity in God. In chapter 5:1, John’s attention is drawn to the right hand of him who sits on the throne. In his right hand, he holds a scroll. This scroll contains the decree of the sovereign Ruler of all. It is the written will of God. But it is sealed with seven seals. No one knows what is written in the scroll except God alone. Then a mighty angel steps forward and says, “Who is worthy to break the seals and open the scroll?” (2) None of the angels dare to step forward. No human being dares step forward. Science and technology cannot help us here; neither can philosophy or psychology. John begins to weep. He may be saddened by the fact that absolutely no one is worthy to break the seals and discover what is written on the scroll. He also has a burning desire to know God’s will, but he is utterly helpless. Have you ever wept out of a deep desire to know God’s will? Most people, even God’s people, don’t really care all that much. We need someone who is worthy to open the scroll for us. Who can do so? Look at verse 5. “’Then one of the elders said to him, ‘Do not weep! See, the Lion of the tribe of Judah, the Root of David, has triumphed. He is able to open the scroll and its seven seals.’” This refers to Jesus Christ. He is the Lion of the tribe of Judah, a prophetic reference to the conquering Messiah (Ge 49:8-12). Christ is the one who reveals God’s will to his people. We learn more about Jesus’ identity in verse 6. “Then I saw a Lamb, looking as if it had been slain, standing in the center of the throne, encircled by the four living creatures and the elders. He had seven horns and seven eyes, which are the seven spirits of God sent out into all the earth.” Although Jesus is called the Lion by the elder, John sees a Lamb, looking as if it had been slain, standing at the center of the throne. Jesus is both the Lion and the Lamb. John the Baptist had called Jesus, “the Lamb of God who takes away the sin of the world” (Jn 1:29). This refers to Jesus’ sacrifice of atonement for us. When Jesus died on the cross, the curtain of separation between God and man was torn in two. Mankind was reconciled to God. From the throne of the Father God, through the Lamb of God, the Spirit is poured out into all the earth. The Spirit draws men to God the Father through Jesus Christ. Christ is the Mediator, who opens the way to God by the power of the Spirit. After the Lamb takes the scroll, another wave of praise and worship breaks forth. This wave is directed to the Lamb by the living creatures and the elders. They recognize that the Lamb is the only one in all creation who can fulfill God’s salvation plan and redeem his creation. True worship of the Lamb requires us to recognize this: Christ is the only one in all creation who can save us. When they realized this, they fell down before him. They also offered up intercessory prayer to God for the salvation of mankind. Intercessory prayer is an important part of worship. Then they take out their harps and sing a new song. Praise music and vocal teams and choruses are an important part of worship. Look at verses 9-10. “And they sang a new song: ‘You are worthy to take the scroll and to open its seals, because you were slain, and with your blood you purchased men for God from every tribe and language and people and nation. You have made them to be a kingdom and priests to serve our God, and they will reign on the earth.’” May God help Triton, DuPage and NIU UBF to form a heavenly praise band to help 800 people to worship the Lamb, Jesus, at the upcoming Summer Bible Conference! The redemption of the Lamb is truly great. Let’s read verses 9-10 again. Christ saves men from every tribe and language and people and nation. Christ saves people from Africa, Asia, Oceania, South America, Europe and North America. Christ’s changing power makes selfish people become sacrificial people, proud people become humble people, corrupted people become holy people. Christ’s redemption produces a kingdom of priests and a holy nation in fulfillment of God’s unchanging hope and purpose. Today we have caught a glimpse of the worship of God and of Christ in heaven. We learned that we need to come before God with awesome respect. Behold the beauty and majesty of our God; worship God, acknowledging his grace and power. Cast our crowns at the feet of Jesus as an act of worship. Initiate worship and inspire others to worship. Come to Jesus, the Lamb of God, humbly ready to learn the many secrets of the Kingdom of God from him. Let’s accept this as our model of worship. Let’s pray that we may worship God our Creator and Christ our Redeemer in a way that pleases him. We should enjoy worshiping God like this for this that is what heaven is going to be all about… worshiping Jesus. May God help us to be Christians who can worship God in spirit and in truth, for these are the kind of worshipers the Father seeks. (Jn 4:23). Read verse 4:1 and 1:1-2. Whose vision was this, through whom was it given and what does it seem to be about?2. Read verses 2-6a. Who was sitting on the throne? How is his beauty described? Who surrounded the throne? How were they dressed? Who might they represent? What does this teach us about God?3. Read verses 6b-8. Describe the 4 living creatures who were in the center around the throne. What does it mean that the living creatures had so many eyes? What did they say? What does this teach about God? 4. Read verse 9-11. How did the 4 living creatures lead in worship? How did the 24 elders respond? What is the content of their songs of worship? Why is God alone worthy of our worship? What can we learn here about God? 5. Read chapter 5:1-5. Who is worthy to open the scroll and its seven seals? Why? Read 5:6-10. Who is the Lamb? Who worships him? Why? How? What do the seven horns and seven heads suggest about him? 6. What does the song in verses 9-10 tell us about Christ’s redemptive work, God’s great world mission purpose and the task he has given his church? Why is this called a new song? 7. Read verses 11-14. Who is worthy to receive the worship of all men and angels and all creation? How should he be worshiped? What can we learn from these chapters about how we must worship God? « Congradulations Andrew Norte on your graduation from NIU. It was an honor for our family to witness the event.